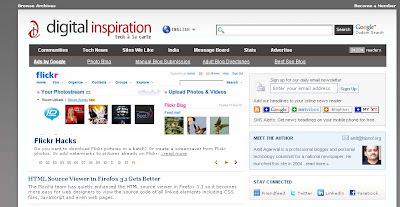 Digital Inspiration is the personal blog of an IIT Engineer called Amit Aggarwal.It can be reached by the url http://labnol.org/ .The buzz about this blog is that he was successful in making serious money through his blog http://labnol.blogspot.com earlier hosted at blogger.Currently labnol.org is powered by Wordpress and looks definitely good on your browser. Digital Inspiration offers reviews of common software, general computer tips, making money online, news from the web etc.He blogs in simple english keeping an average web user in mind.This indian blogger is a premium adsense publisher and he earns great from this blog. We can see that he has not put any ads that is going to irritate a general user.All he does is put relevant ads on his neatly designed page.No popups are present on this site and it is absolutely safe to browse. There are many ways in which social power of the users is taken in to consideration.A geographical map of the user's location is available.iGoogle gadgets, facebook application etc are present in this site to drive more popularity. You can find the links to good blogs around the world on this blog.India specific content can be aggravated by a simple click.Basically this blog is a tech blog so there is a link Tech News in the home page.A message board present is active and useful for fellow bloggers and those trying to make money online. RSS Feeds can be subscribed via reader or by email.I first visited this site due to a video made by the blogger that got published in Adsense Blog.There is a similar video of a CNN IBN newsclip about this site. The veridict is this is a good blog that you can visit regularly to brush up your skills.